Summary: If you only have $300 to spend for a convertible mini laptop, the Yoga 300 11 is a good pick and offers more RAM and storage space than other similar devices in this price range. Buyers will have to settle for a poor screen and a small battery though. 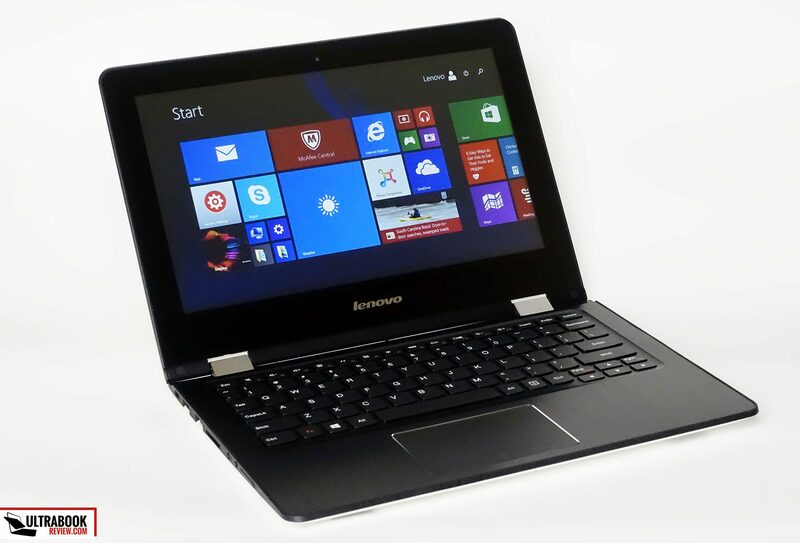 There are quite a few 11-inch mini laptops with affordable price tags out there, and the Lenovo Yoga 300 11 (also known as the Flex 3 11 in some parts of the world) is Lenovo’s offer in this competitive niche. 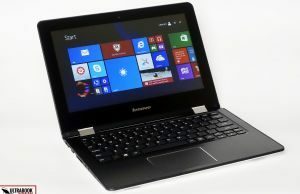 It’s a hybrid that sells for between $300 and $400 and includes a 360-degrees convertible screen, fairly nice aesthetics, a good keyboard and Intel BayTrail-M hardware, among its strong selling points. Those are paired with a small battery though, a subpar screen and a glitchy trackpad, even by the segment’s low standards. That’s the short story. The detailed review awaits for you below, where I’ve gathered my impressions after using a Yoga 3 11 for a little over one week. 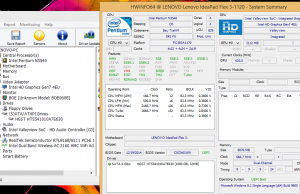 The test unit came from Lenovo for the purpose of this test. It went back to them once the article was published. 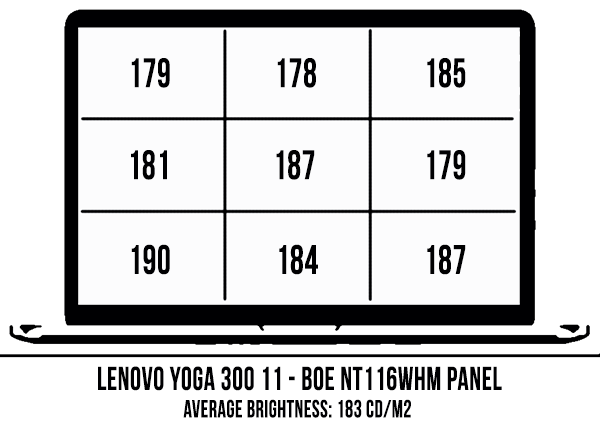 We have the higher-specked version of the Yoga 300 for this test. 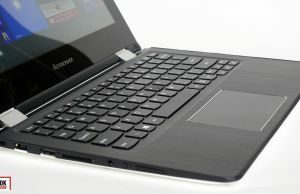 The base version has a retail price of $299 and includes a slower Celeron N2940 processor and only 4 GB of RAM. 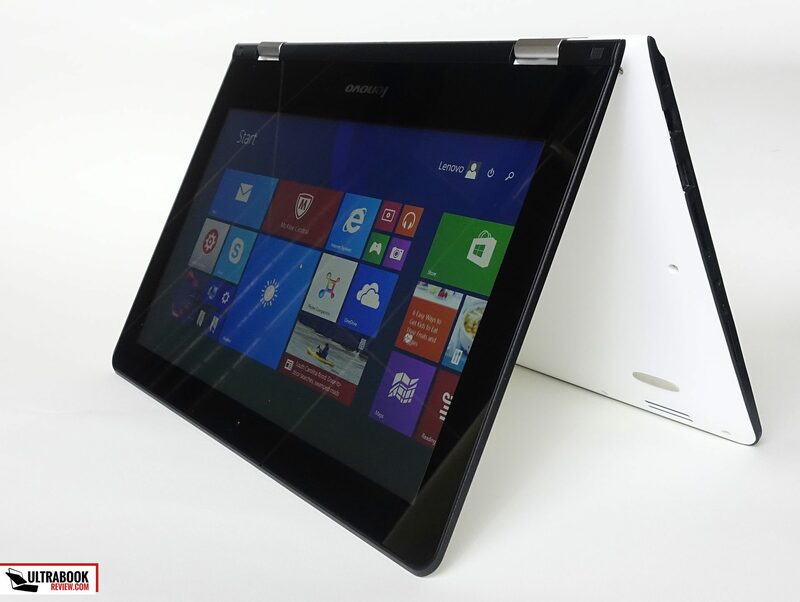 I got to test the white version of the Yoga 300 11 and I think it looks really nice for a device in this price range. 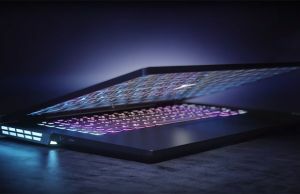 Plastic is used for the entire case and the chassis, but it’s a smooth plastic that feels nice to the touch, offers grip and won’t show scratches and smudges easily. The build quality is pretty good as well, as there’s little flex in the screen or the main-body, but the case does squeak when pressed or grabbed firmly. 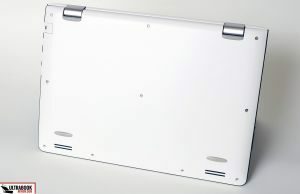 A set of hinges holds the screen in place and allow it to convert into the Tablet, Stand or Tent modes. These hinges are strong and made of metal, but they squeak when flipping the screen. I can’t tell whether that’s going to be an issue with the devices you’ll be able to buy in stores or just an isolated incident with this review sample. Now, once you open the lid you’ll notice a dark interior. 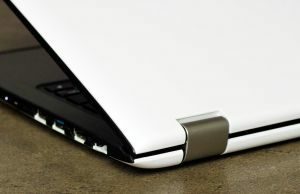 The palm-rest and the entire area around the keyboard are covered in a sheet on brushed aluminum, while the edges around the interior and the screen are made from a rougher type of plastic. 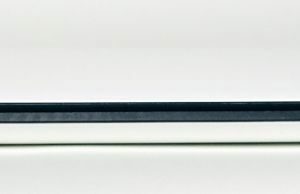 These edges are meant to protect the inner surface and the screen, as they are slightly raised, in order to prevent the display of touching the keyboard when the screen is closed, or protect the metallic finish and the keys of coming in contact with any surfaces when you’ll have the Yoga on a desk in Tablet or Stand modes. 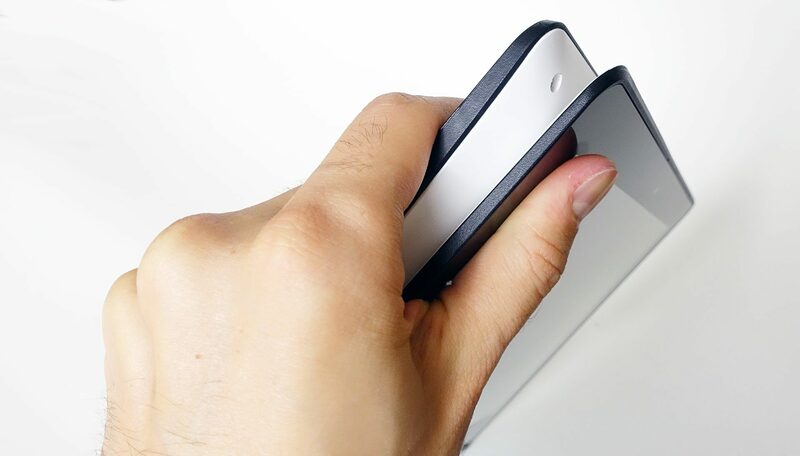 In this case, the device will lean on this plastic rim around the body, and not on the palm-rest or the keys. That’s a neat approach, but keep in mind this rim is a bit sharp and your wrists won’t be happy about that. 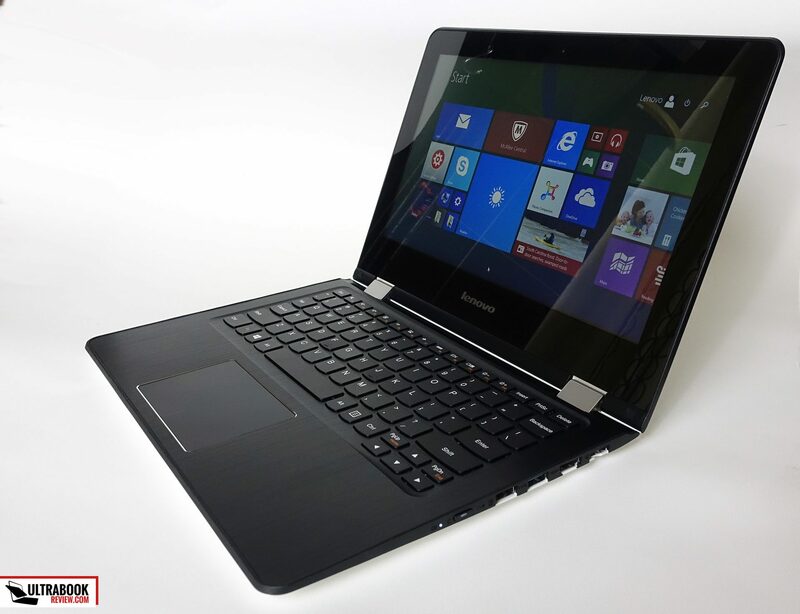 Overall though, this Yoga 300 11 is one of the better built and better looking devices in its class. 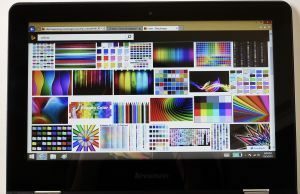 Lenovo doesn’t offer any colored versions of it, unlike some of the competition, and that could be a deal-breaker for some of you. On the practical side, I have to add that the hinge mechanism is strong and well executed, so I could easily lift the screen with a single hand. Switching between modes is buttery smooth as well. 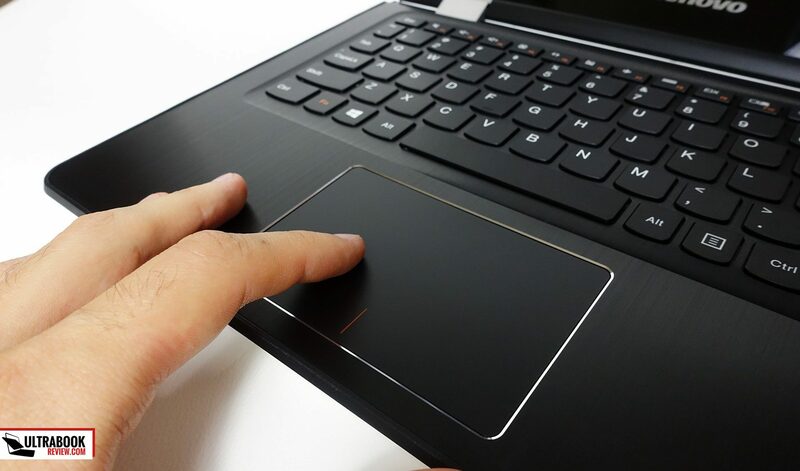 Once the device detects it’s no longer in laptop mode (the screen tilts past 180-200 degrees), it will automatically disable the keyboard and trackpad, so you don’t activate them by mistake. On the other hand, this hybrid struggles as a tablet, since it’s rather heavy, chunky and difficult to grab and hold, mostly due to how the screen and the main-body are designed and fit together in this mode (as you can see from the pictures). The last thing we’ll discuss in this chapter is the IO. I have little to complain here, as this notebook offers three USB ports, a full-size HDMI connector, a LAN port and an SD card-reader. An SD card doesn’t fit flush inside though. The charging port is smartly placed on the left edge, where you’ll also find a Kensington Lock. 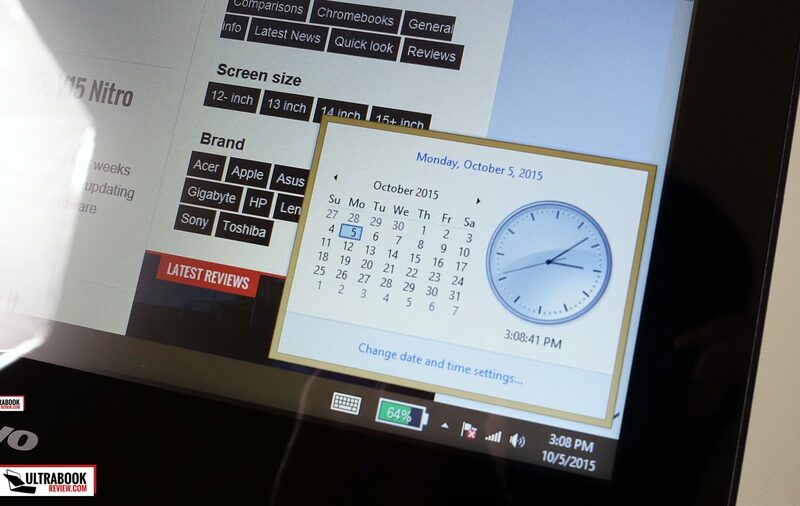 I was impressed by the keyboard on the Yoga 300 11 is and that doesn’t happen often. It sits high on the body, leaving plenty of room for a spacious arm-rest, and offers a good typing experience. The keys are firm and well spaced, while the layout is simple, standard, without any unusual experiments. The stroke is short and the keys don’t pose much resistance, but these aspects had little impact on my accuracy once i got used to the overall feel. 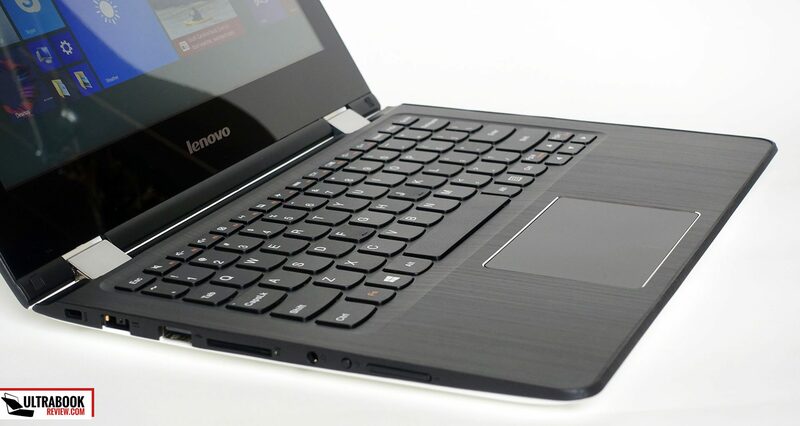 The stroke is not shorter than on other thin-and-light laptops, but since this laptop is not exactly the thinnest of them all, Lenovo could have done a better job here. 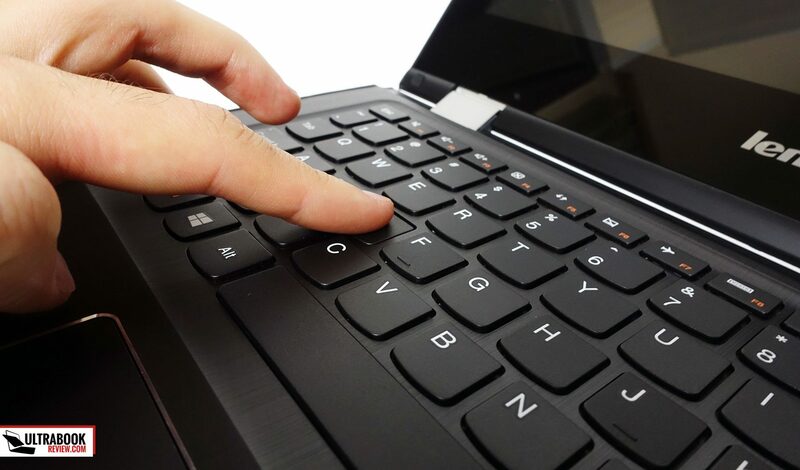 The keyboard on the larger Yoga 500 for instance has similar keys, but because they are taller and stiffer, offer improved feedback. I found the trackpad on the other hand rather crappy. 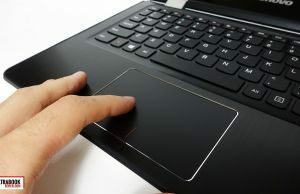 It’s well sized and spaced-out from the palm-rest, but its rough plastic surface feels weird, especially in this day and age when most manufacturers use smooth touchpads. 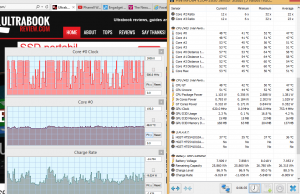 Still, that’s not the main issue, performance is. 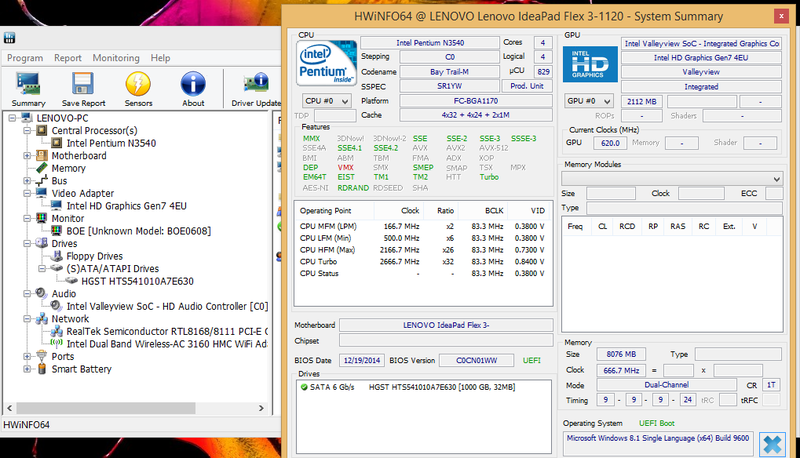 Despite being a Synaptics surface and having plenty of adjustability settings, I couldn’t get this to perform well with precision swipes or when clicking with one finger and swiping with another, and I couldn’t get Two-Fingers taps to work either (this is a know problem with Lenovo laptops and can be addressed through registry editing, but that’s not something most users will know how, or want to do). 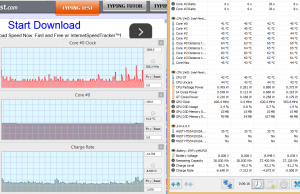 Bottom point, the keyboard on the Yoga 300 11 is good, although shallower than on other Lenovo laptops, but the trackpad needs improvement, at least based on my experience with this test unit. Then there’s the display. 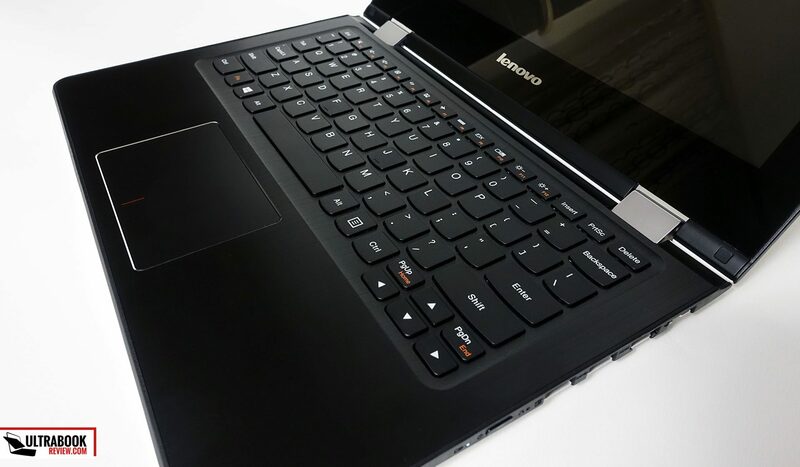 Lenovo uses a touchscreen on this 11-incher and everything works as expected on this front. It doesn’t include a digitizer or proper pen support, but I haven’t encountered any glitches when swiping and and tapping with my fingers. The hinges keep the display firmly in place and have a significant impact on the overall experience. 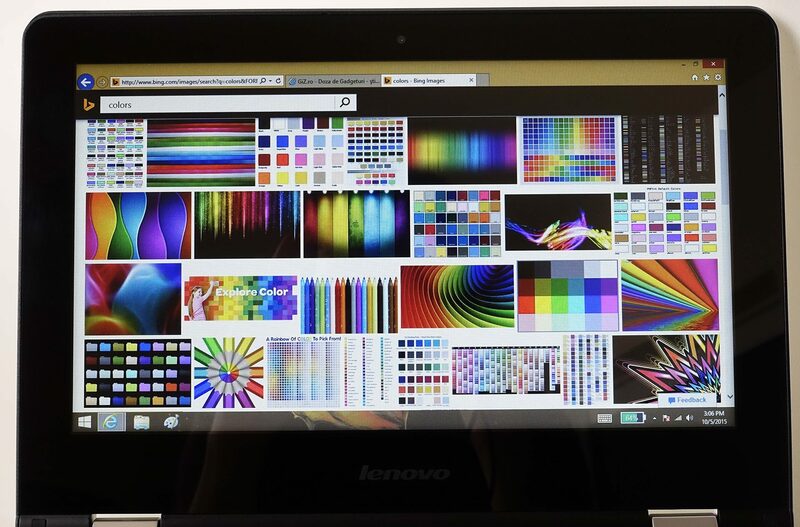 However, Lenovo went for an 11-inch 1366 x 768 px TN panel for this device, which translates in rather poor viewing angles, color reproduction, brightness and contrast, as you can see in the results below (taken with the Spyder4 Elite). 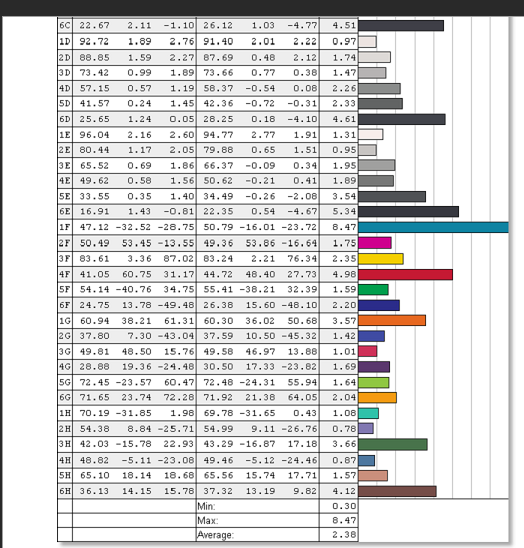 average DeltaE: 9.55 uncalibrated, 2.38 calibrated . How do these translate in everyday use? Well, the screen is dim, and because of its glossy finish, it barely usable in any bright-light environments or outdoor use. The viewing angles are somewhat limited, but they are better than on most TN panels, so as long as you look at the screen straight on or from a medium lateral angle, they won’t bother you much. 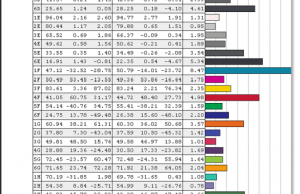 The colors on the other hand are skewed rather badly, especially the Reds and the Blues. A calibration run helps somewhat, but don’t expect to perform any color accurate work on this thing. It’s true that similar 11-inchers offer the same kind of displays, especially around the $300 price-point. 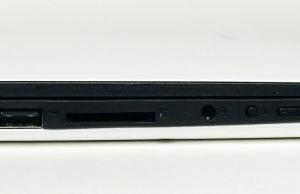 If you’re willing to spend around $100 more for your computer, you can get 11-incher with way better IPS panels, like the Dell Inspiron 11 3000. We’ll talk about it further down, in the Competitors section. 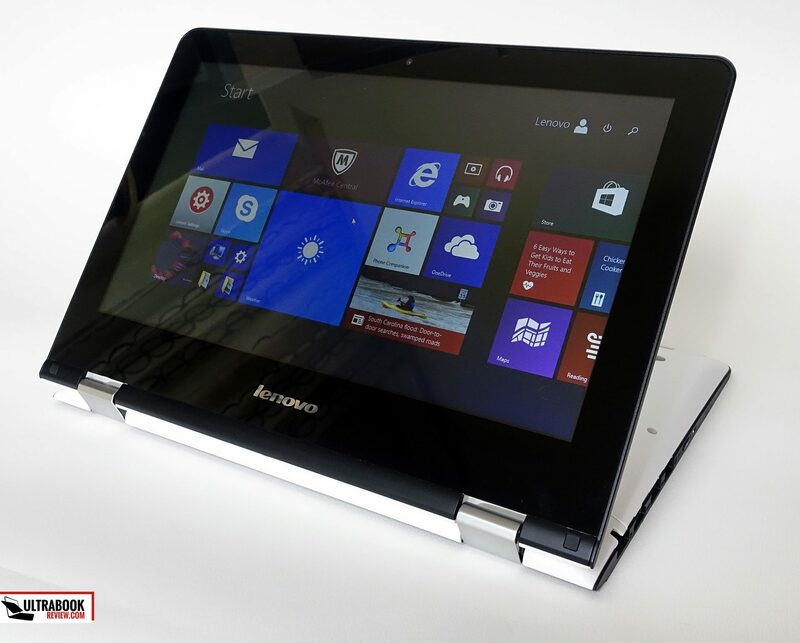 Hardware wise, this version of the Lenovo Yoga 300 11 is built on an Intel BayTrail-M platform, with a Pentium N3540 processor, 8 GB of RAM and a 1 TB HDD. The storage unit is upgradeable, but the RAM is not, so if you’ll buy one of the versions with only 2 or 4 GB of RAM you’ll be stuck with it for good. 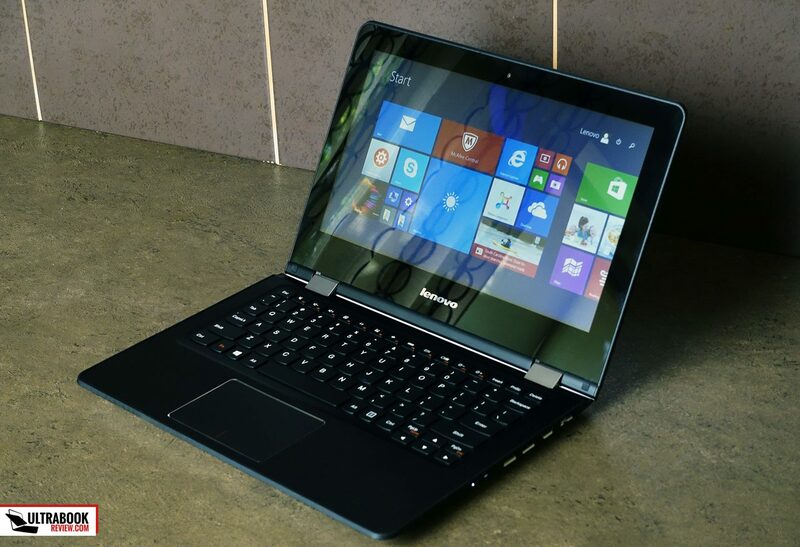 With such hardware, the Yoga 300 11 is not going to be a performer, but it was never designed as one. It was meant to handle light everyday tasks, while running quiet (this is a fanless platform) and cool. And it will get the job done as long as you stick to browsing with a few tabs open, watching movies or stream clips from Youtube and Netflix in 1080p, editing Office documents, listening to music and so on. 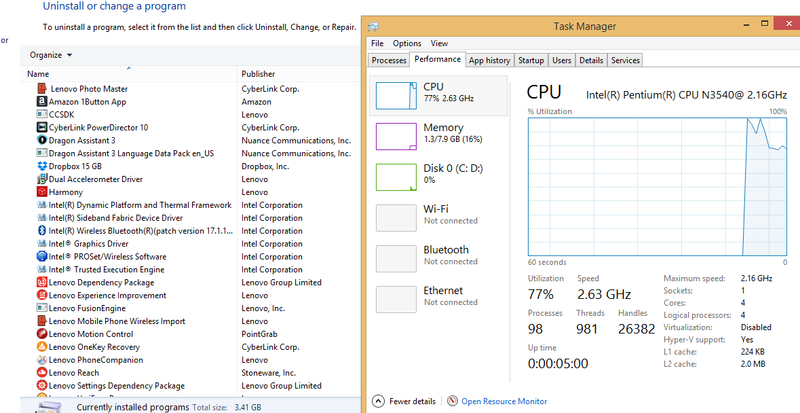 This little fellow can handle some multitasking as well, but don’t try to run too many things at once or it will choke. In other words, if you’ll keep to basic tasks and be patient when the occasional sluggishness will occur, you’ll get along fine with this computer. 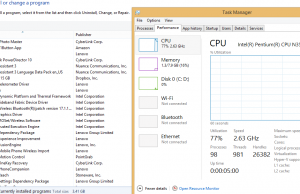 Out of the box though there’s a lot of bloatware preinstalled, with a dozen of Lenovo apps and half a dozen of third party software as well, from McAfee, CyberLink, Amazon, Dropbox or Microsoft. I’d advise most of you to get rid of these in order to speed up the machine. However, if you’re using Dropbox, you might want to redeem those 15 GB of Free Storage space available for 6 months. 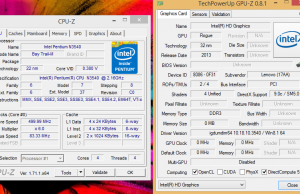 I ran some benchmarks on this Yoga 300 11 and you can find the results below, if you’re interested in such aspects. 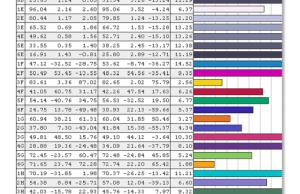 X264 Benchmark 4.0: Pass 1 – 55.71 fps, Pass 2 – 11.21 fps. Long story short, this Yoga 300 11 is not a performer, but will handle everyday tasks fine, as long as you keep your demands at bay. Just don’t expect to run demanding software, modern PC games or multitask between many apps at once, this machine won’t be able to face such chores. 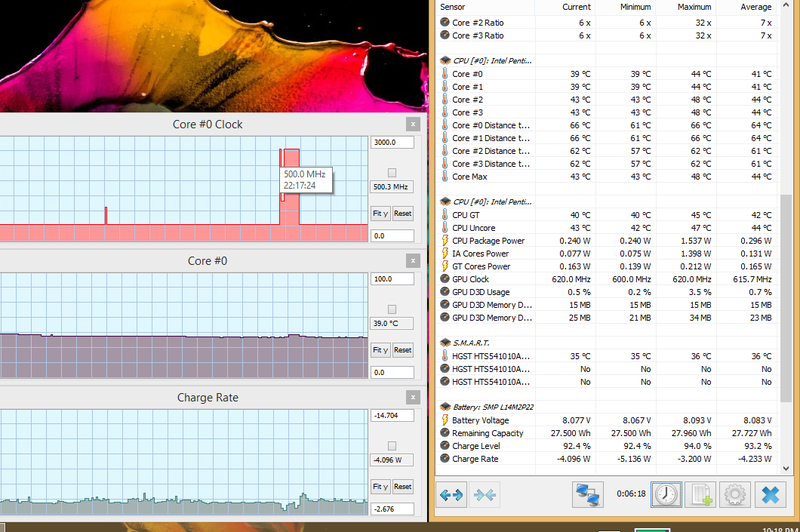 This laptop gets a bit warmer than I would have liked in everyday use, but nor the hardware inside or the outer-case reach extremely high temperatures. 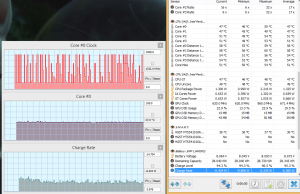 Still, as you can see in the pictures below, while looping a 1080p movie, certain spots on the back go past the 35 degrees Celsius mark. 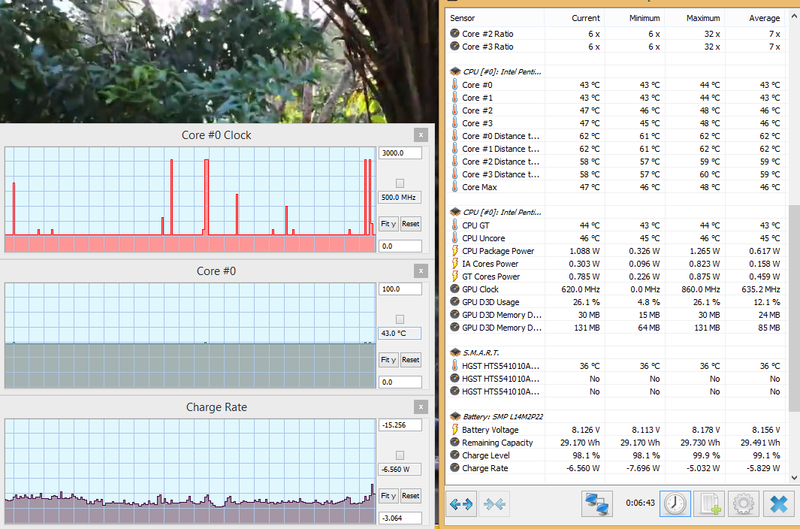 That’s a bit unexpected, as other 11-inchers run cooler and this Yoga is not a very slim machine after all. If you’ll push this little fellow even more, the belly will go above 40 degrees and at that point you won’t be able to use the Yoga comfortably on your lap. 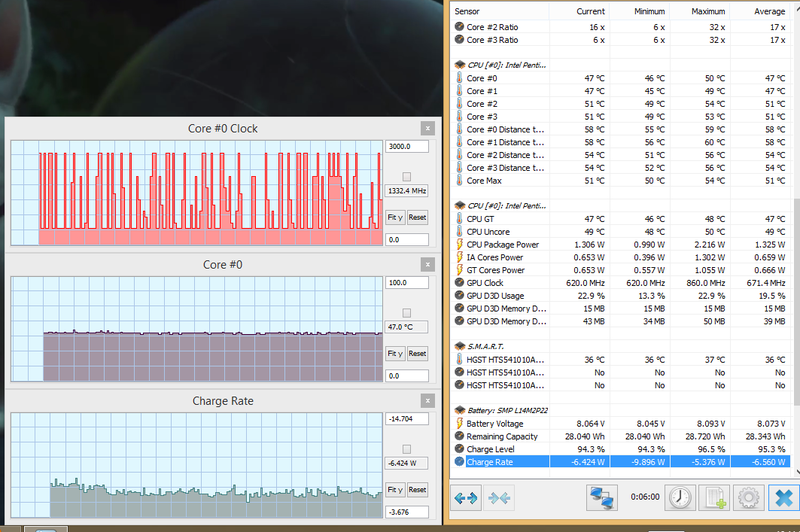 I haven’t tried to run any games, but expect the case to get close to 45 degrees if you push the hardware to its limits. 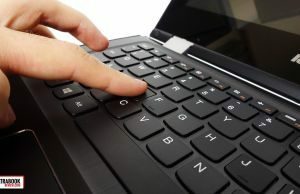 You’ll also feel the heat at keyboard-level, especially with the metallic coating on the palm-rest and around the keys. 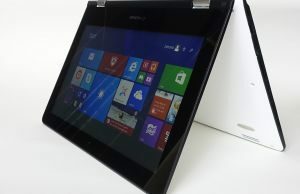 Moving on to noise, the Yoga 300 11 is built on fanless hardware, but it does bundle a mechanical HDD and you’ll hear it cranking and spinning in a quiet room. 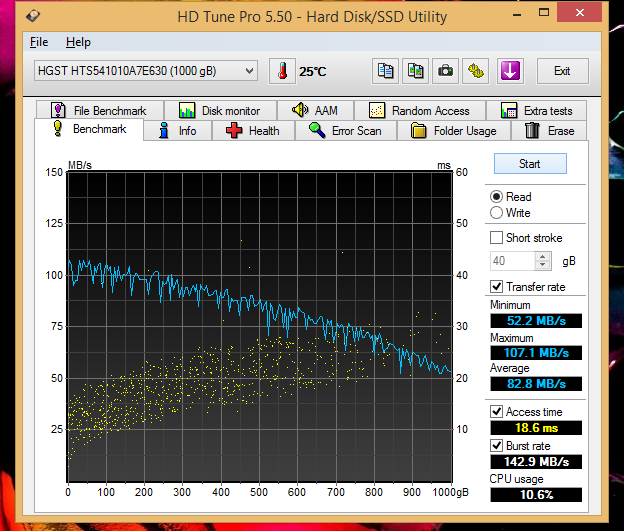 So if you want this to be dead-silent, you’ll have to replace the HDD with an SSD. Connectivity wise, there’s little to complain here, since the laptop offers Bluetooth, Gigabit Lan and Wi-Fi. Lenovo went for an Intel AC 3160 wireless module, a rather slow one only capable of reaching speeds of around 50-55 Mbps in close proximity of my router. The signal remains strong at 30 feet and the speeds barely drop by a few Mbps, so overall most users will be happy with the wi-fi performance. You can switch to the wired connection when in need of faster speeds. 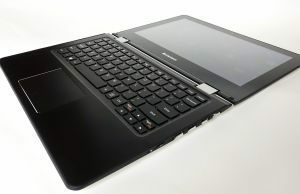 The speakers are placed on the bottom, towards the laptop’s front, and bounce sound off the table and towards the user. As long as you make sure not to cover them in any way, they are fairly loud (about 80 dB at head-level) and push decent quality sound, for this class. Don’t expect bass or high-quality audio of any kind, of course, but for movies and some music I’d say this audio system will do. The speakers will face you when with the Yoga in Tablet or Tent modes, and that has a positive impact on how the audio is perceived. Last but not least, there’s a 720p webcam placed on top of the screen. It will do for occasional calls, but the image quality is very grainy, among the worst I’ve tested lately. Lenovo bundles the Yoga 300 with a gesture app that allows you to perform various gestures to turn up and down the volume, swipe between images etc. It works fine, but I can’t see why anyone would want to use this daily. This is where the Yoga 300 11 falls short, just like its predecessor, the Yoga 2 11 , and that’s because Lenovo only bundles the Yoga 11 with a 30 Wh battery. For the sake of comparison, most other manufacturers put a 30 Wh battery in their smaller 10-inchers. 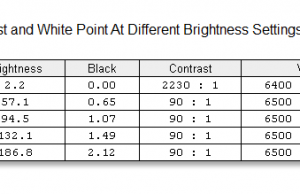 As a result, you shouldn’t expect more than 3-5 hours of daily use from this device, as you can see from the rows below (the screen is manually set at 60% brightness, which is about 120 nits). 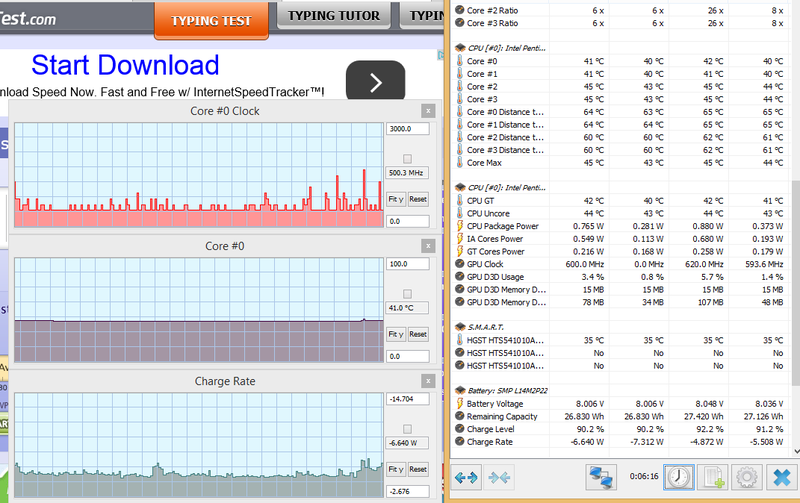 On the other hand, the laptop charges quickly, in under 2 hours. A 45 Wh power-brick with a long power-cable is included in the pack. The Yoga 300 11 is available around the world and the configuration tested here sells for around $400 in the US or 400 EUR in Europe. 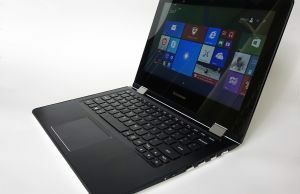 However, it’s sold as the Lenovo Flex 3 11 in some regions. 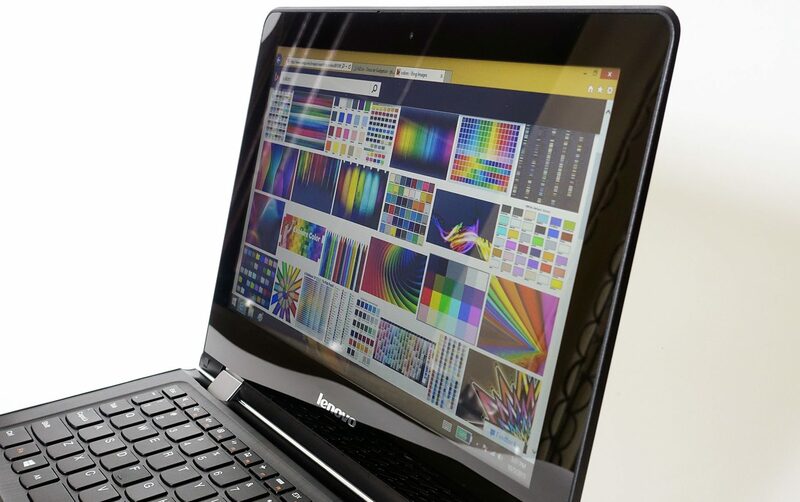 Don’t confuse it with the Yoga 3 11, that’s a different machine with faster hardware and more premium specs. 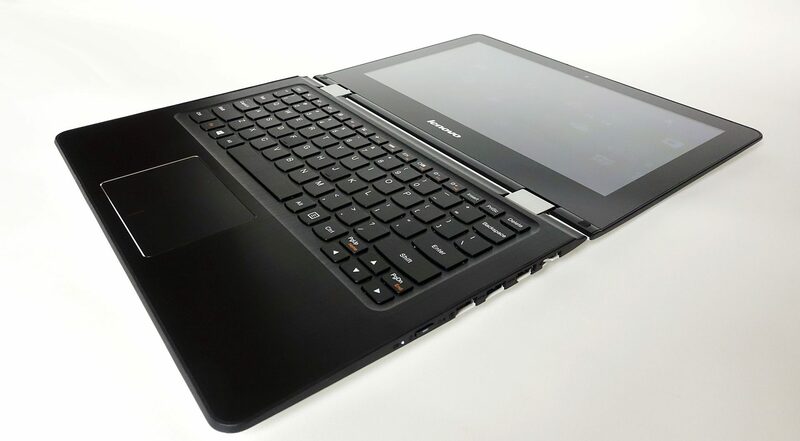 The base models with a Celeron N2940 BayTrail processor, 4 GB of RAM and a 500 GB HDD is available in the US for around $300. You should follow this link for more details, configurations and up-to-date prices at the time you’re reading this post. The Dell Inspiron 11 3000, HP Stream X360 11, Acer Aspire R 11 or the Asus Transformer Book Flip TP200 are some of the alternatives you can consider over this Lenovo. 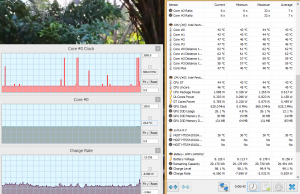 The Inspiron 11 3000 is the better of the pack, and only slightly more expensive. A Pentium N3540 configuration with 4 GB of RAM and a 500 GB HDD has a list price of $450, but you can find it for around $400 online. $450 on the other hand can buy you a faster Core i3 configuration. 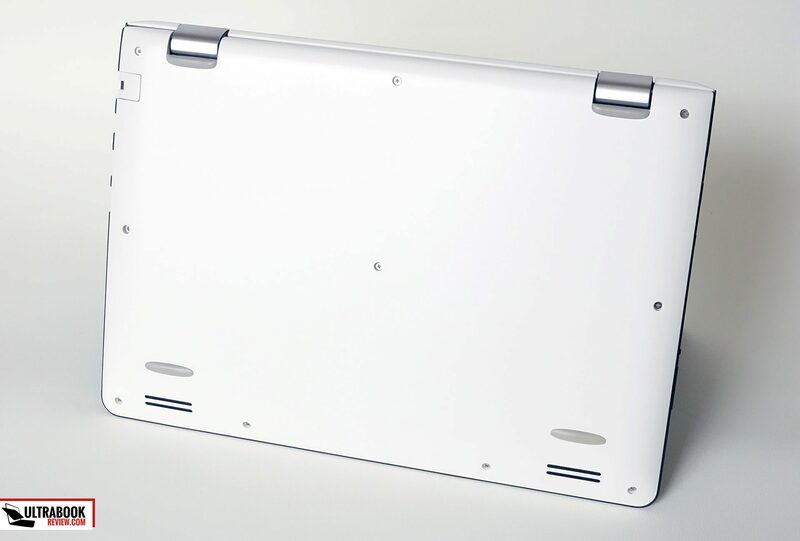 Compared to the Yoga 300 11, the Inspiron packs a much improved IPS display and a larger 43 Wh battery. 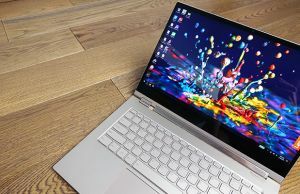 The Acer Aspire R 11 (review) is built on a newer Braswell hardware platform and packs a 50 Wh battery, so it’s an upgrade both in terms of performance and battery life. Buyers will have to settle for the heavy body (3.5 lbs) and the poor TN screen though. The cheapest models start at $250, but that’s for a configuration with 2 GB of RAM and only 32 GB of eMMC storage (which cannot be upgraded). Higher specked models sell for over $350. You’ll find more about it here. The HP Stream x360 11 sells for under $300, but that’s for a Celeron configuration with 2 GB of RAM and 32 GB of eMMC storage. It gets a TN screen and a 29 Wh battery, but it’s also available in a few lively colors that might appeal to some of you. 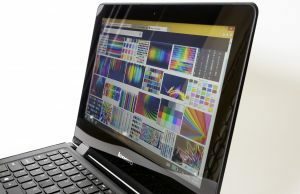 The Stream is only an alternative to the base version of the Yoga 300 11, but Lenovo also sells a Pavillion X360 11-inch model with Core i3 hardware for around $450. Last but not least there’s the Asus Transformer Book Flip TP200SA, another Braswell laptop, but lighter than all the others in this class. 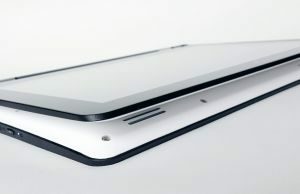 It tips the scale at 2.6 lbs and includes a 38 Wh battery and a HD IPS screen. 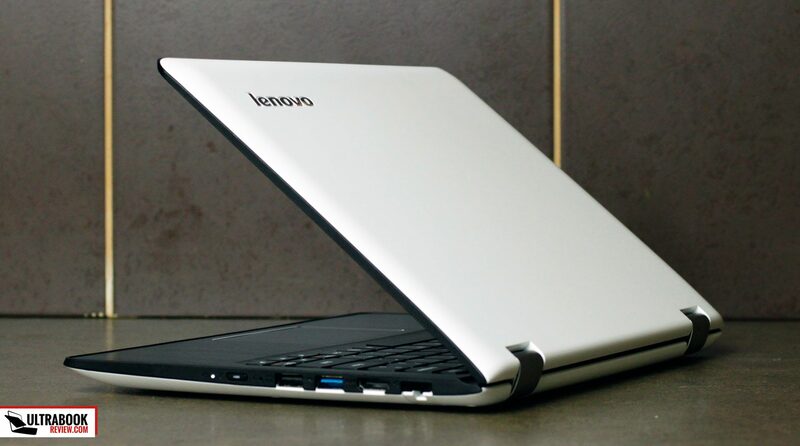 The base model with a Pentium N3050 processor, 4 GB of RAM and 64 GB of SSD storage sells for around $350. You’ll find more about the TP200 via this link. At the end of the day, if you only have $300 or less to spend for an 11-inch convertible, the Lenovo Yoga 300 11 is going to be one of your better options, as the base model includes 4 GB of RAM and plenty of storage space in this budget. 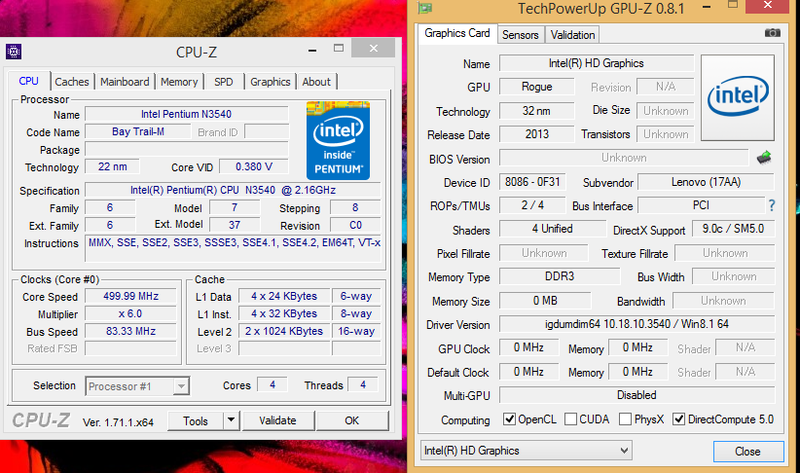 You’ll also get a well built and fairly nice looking machine, a good keyboard and a proper IO. However, the Yoga 300 11 looses major points when it comes to the screen and battery, which are both crucial aspects on an ultraportable device these days, at least in my book. Thus, if you can expand your budget to $350-$400, there are better options for you out there, as you saw in the previous chapter, with IPS displays, larger batteries and in some cases even updated hardware. In your search for the perfect compact convertible you should also go through this list of the best ultraportables of the moment, or this selection of my favorite 11 inchers. And if you have any questions or anything to add to this point, get in touch in the comments section. 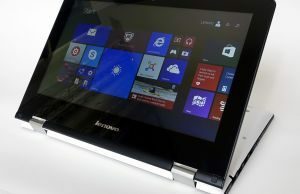 I was confused whether or not to buy lenovo yoga 300.Ive been reading all the reviews about it for last few days.Reading this article,has definitely cleared that doubts I had in my mind,about lenovo yoga 300.Definitely the best and complete review i could find.Really liked the section where you included the competitors names.Helped me compare other similar options too.Thank you,mate. I was unfortunate and on a budget enough to buy this awful notebook. I hate it. 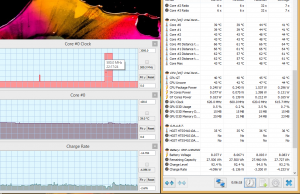 It`s slow as hell, when you try to do two things at the time, like… open Chrome and close Excel it takes ages, when it doesn`t black out at all. Lot`s a preinstalled things that pop up all the time. Tricky mouse pad. Screen blinks. I don`t know why did they released this to the market. I hate it. This laptop actually has a bug, you have to update your windows 10 first to the latest version then itll run smooth, and before that you need to uninstall realtek hd driver first, its buggy with realtek HD, i removed that first then i go update the windows, then it works flawless, i dont have any problems whatsoever. 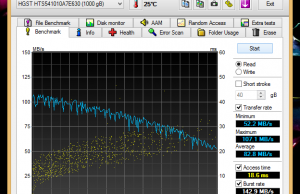 the realtek hd driver will work smooth without bug after you did an update of the windows 10! i actually love this laptop! good screen color, i can play some games like bit demanding one , driver san fransisco smoothly, cod MW 3 on 720p with some lil lag on lil part on max settings but smooth if u turn off the shadows. 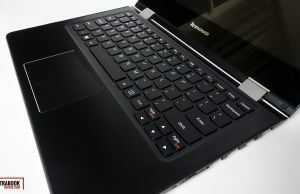 Its a nice laptop, i got the 4GB RAM and 500GB HDD version one. Hello! I'm considering purchasing the same one as you did… Have you ever used it for multimedia conversion? (as in, running handbrake or any other similar software) I run this kind of software frequentely, and was wondering how slow it may be…Thank you very much for your answer! 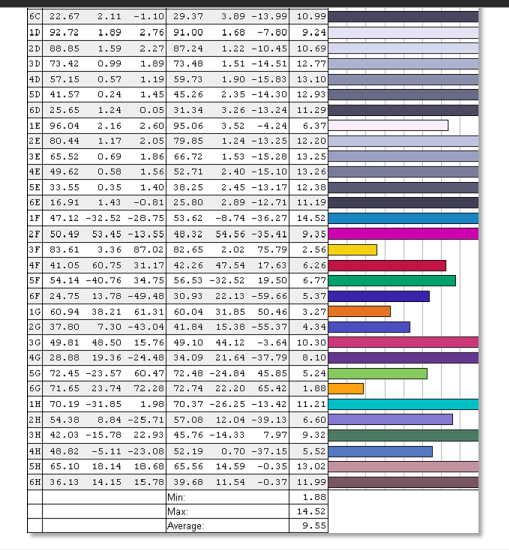 I am a 66 year old "no hoper" with this stuff but am a qualified engineer so I have a pretty good way of swimming to a pretty logical outcome to a problem given good information to work with – which on reading through your wonderful informative and educational web site I have a much finer grasp here of what I think I need. I need a small light weight unit for travel overseas as my ACER Aspire Timeline X is a real brick to take. Our needs are basic – keep track of e-mails, a bit of google and pay a few bills etc. My deduction is 1. DELL Inspiron 2. 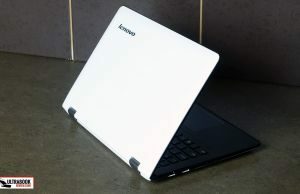 ASUS transformer 3.LENOVO 4. 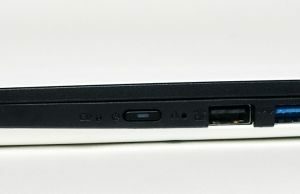 HP Stream 5. 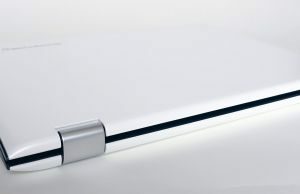 ACER Aspire R11. Hope I got this sort of right – I felt like I was on the Great Ocean Road on my Ducati blind folded before I read your informative collection of information.